google-site-verification: google8d8438b214143f71.html Beautiful Quotes: The 5 Types Of Headaches And The Best Way To Treat Them. 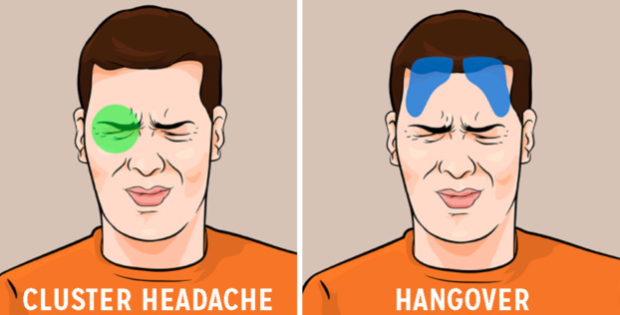 The 5 Types Of Headaches And The Best Way To Treat Them. Those of us who suffer from frequent headaches know just how debilitating they can be. While you’re in the middle of one of these situations, however, it can be hard to differentiate between exactly what kind of pain is happening and how to deal with it. Still, there are very distinct kinds of headaches each with different causes. Here’s a helpful guide that features the 5 different types of headaches as well as how to treat them. The first one is the tension headache. This one is characterized by a general dull pain throughout the whole head, pressure in the forehead and temples and tension or spasms around the eye area. Though not necessarily an intense pain, it is irritating and can be distracting. Generally, these headaches are the result of too much stress, bad posture or head and neck injury. For these aches, generally, a mild painkiller can do the trick to alleviate the pain as can some moderate exercise. Still, if these are a frequent problem, a trip to the doctor might be necessary. Sinus headaches, as the name might suggest, are caused by sinusitis—and they often come with a whole slew of other symptoms, unfortunately. This one is categorized by a general fatigue throughout the head and body, pain and pressure in the nose and a general feeling of congestion in the forehead and under the cheeks (ie, in the sinuses). These are generally caused by seasonal allergies or having a cold. These are a little tougher to take care of, unfortunately, though taking over-the-counter antihistamines can provide some relief. For more serious cases related to a sinus infection, a doctor can prescribe antibiotics as well. Of all the headaches to get, migraines are generally considered one of the most severe and come with a wide range of symptoms. Before an actual headache hits, there are sometimes preemptive symptoms of irritability, fatigue, and changes in appetite which can last for a day or two. An actual headache itself includes problems centered around the eyes which can cause tingling, numbness and light sensitivity which may last for a half hour or so. A headache also includes a severe, throbbing pain in the temples which can last up to 72 hours. Finally, the resolution phase which lasts up to 24 hours can lead to fatigue and problems concentrating. Unfortunately, there is no long-term cure for migraines though a number of treatments can alleviate the pain. Regular exercise can help though doctors can also prescribe medications for more serious cases. Though cluster headaches affect less than 1% of the population, they can create some serious pain for those who do suffer from them. Unlike other headaches, these are usually centered on one side of the head—specifically behind the eye—and causes sharp stabbing pain. These generally last for 15 minutes to an hour and may cause sensitivity to light during that period. These are more elusive than other headaches as scientists don’t know what causes these issues. To really get to the bottom of these, seeing a doctor is probably necessary. Last but not least, there’s the hangover. This one is a classic and stems directly from drinking too much alcohol from the night before and being dehydrated and drained of important vitamins and nutrients. These are characterized by throbbing, dull pain throughout the head and can also include tightness and a general feeling of heaviness. Though there are no quick solutions to the hangover problem, it’s best to drink a lot of water and take a painkiller if the pain is too severe. If everything else fails, climbing in bed might be the answer.